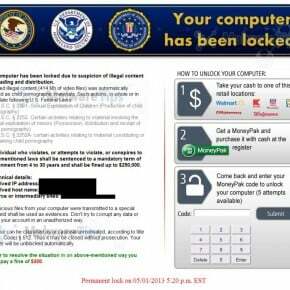 If your computer is locked, and you are seeing a “Your computer has been blocked” notification,then your computer is infected with a piece of malware known as Trojan Reveton. The “Your computer has been blocked” notification is a computer virus, which will display a bogus notification, that pretends to be from the official law enforcement agency and states that your computer has been blocked due to it being involved with the distribution of pornographic material, SPAM and copyrighted content. The “Your computer has been blocked” virus will lock you out of your computer and applications, so whenever you’ll try to log on into your Windows operating system or Safe Mode with Networking, it will display instead a lock screen asking you to pay a non-existing fine of 300$ in the form of a Ukash,MoneyPak orPaySafeCard code. Furthermore, to make its alert seem more authentic, this virus also has the ability to access your installed webcam ,so that the bogus “Your computer has been blocked” notification shows what is happening in the room. The “Your computer has been blocked” notification is used by cyber criminals alongside the name of known international law enforcement agencies like Federal Bureau of Investigation (FBI),Europol and Central Intelligence Agency (CIA), or local law enforcement agencies like: West Yorkshire Police,Metropolitan Police and The United States Department of Justice. 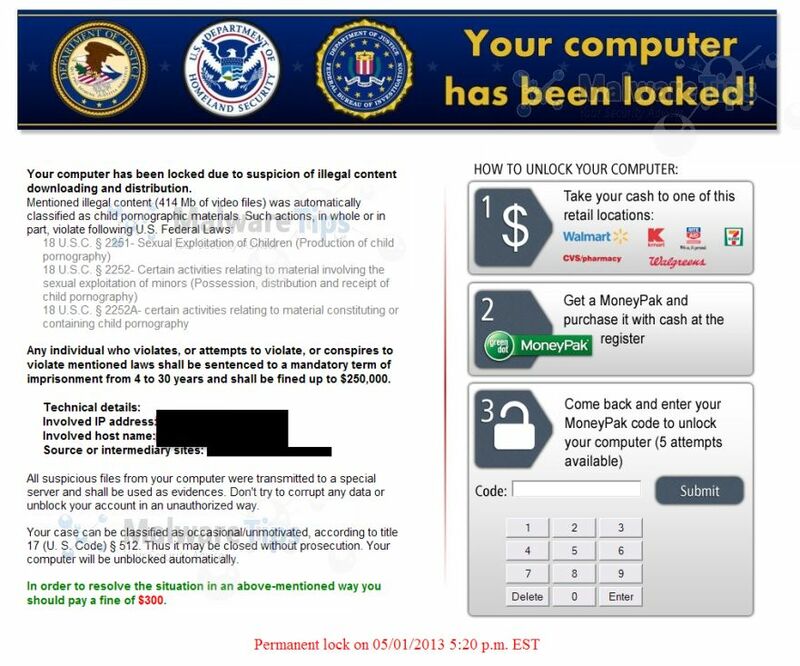 The “Your computer has been blocked” Ransom is a scam and you should ignore any alert that this malicious software might generate. Under no circumstance should you send any money to these cyber criminals,as this could lead to identity theft,and if you have, you should contact your credit card company and dispute the charge stating that the program is a scam and a computer virus. Some variants of “Your computer has been blocked” virus will allow the users to start the infected computer in Safe Mode with Networking without displaying the bogus lock screen. In this first method, we will try to start the computer in Safe Mode with Networking and then scan for malware to remove the malicious files. If your computer has started in Safe Mode with Networking, you’ll need to perform a system scan (as seen on STEP 2) with Malwarebytes Anti-Malware and HitmanPro to remove the malicious files from your machine. 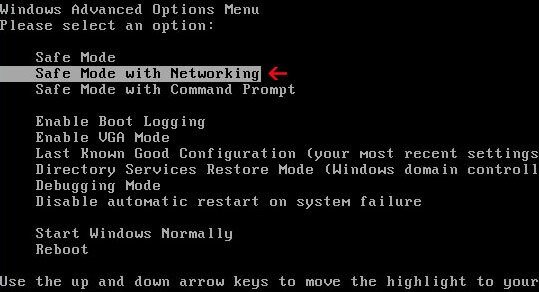 IF the “Your computer has been blocked” virus didn’t allow you to start the computer in Safe Mode with Networking,you’ll need to follow Method 2 to get rid of its lock screen. System Restore can return your computer system files and programs to a time when everything was working fine, so we will try to use this Windows feature to get rid of “Your computer has been blocked” lock screen. At the command prompt, if you are using Windows Vista, 7 or 8 type C:\windows\system32\rstrui.exe , and then press ENTER. If you are using Windows XP, you will need to type C:\windows\system32\restore\rstrui.exe, and then press ENTER. 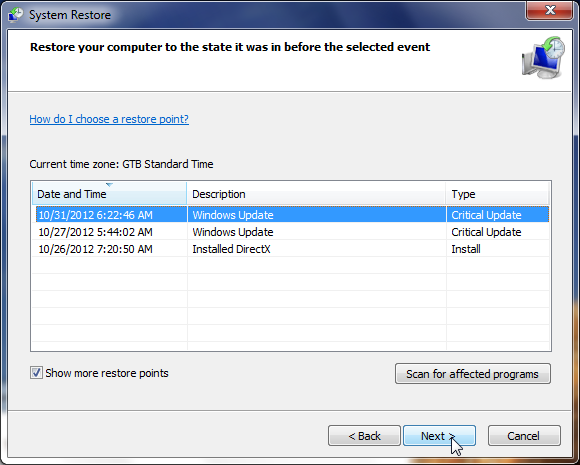 The System Restore utility will start, and you’ll need to select a restore point previous to this infection. After System Restore has completed its task, you should be able to boot in Windows normal mode, and perform a system scan (as seen on STEP 2) with Malwarebytes Anti-Malware and HitmanPro to remove the malicious files from your machine. IF the “Your computer has been blocked” virus didn’t allow you to restore your computer to a previous point, you’ll need to follow Method 3 to get rid of its screen lock. When your computer was infected with the “Your computer has been blocked” virus, this trojan has set a its malicious files to start whenever your computer is booting. IF you didn’t have a restore point, we can use msconfig to remove it’s malicious start-up entry. 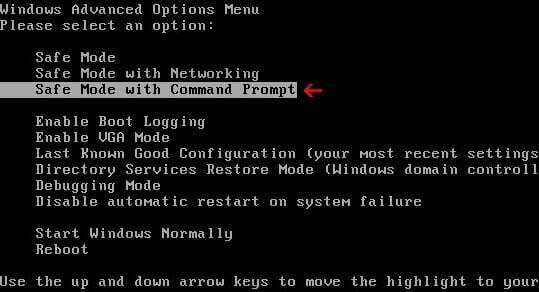 While your computer is in Safe Mode with Command Prompt, type msconfig to start the Windows System Configuration utility. Click on the Startup tab, then search for any suspicious or unknonw entries (random numbers or letters, ctfmon.exe, and other suspicious or unknown entries), and unckech them from startup, then click on OK. This will stop the “Your computer has been blocked” virus from starting with Windows, however it won’t remove the malicous files from your computer. Type shutdown /r in the command prompt to restart your computer, then perform a scan with Malwarebytes Anti-Malware and HitmanPro as seen on STEP 2. IF the “Your computer has been blocked” virus didn’t allow you to start the computer in Safe Mode with Command Prompt you’ll need to follow Method 4 to get rid of its screen lock. 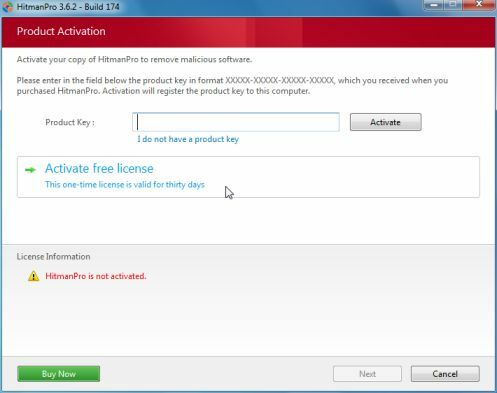 IF you couldn’t boot into Safe Mode with Command Prompt or didn’t have a System Restore point on your machine, we can use HitmanPro Kickstart to bypass this infection, and access your computer to scan it for malware. We will need to create a HitmanPro Kickstart USB flash drive,so while you are using a “clean” (non-infected) computer, download HitmanPro from the below link. After you have create the HitmanPro Kickstart USB flash drive, you can insert this USB drive into the infected machine and start your computer. Once the computer starts, repeatedly tap the F11 key (on some machines its F10 or F2),which should bring up the Boot Menu, from there you can select to boot from your USB. 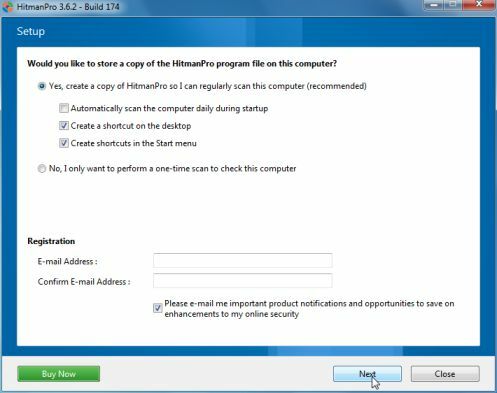 After HitmanPro Kickstart has completed its task,you should be able to boot in Windows normal mode,from there you’ll need to perform a system scan (as seen on STEP 2) with Malwarebytes Anti-Malware and HitmanPro to remove the malicious files from your machine. 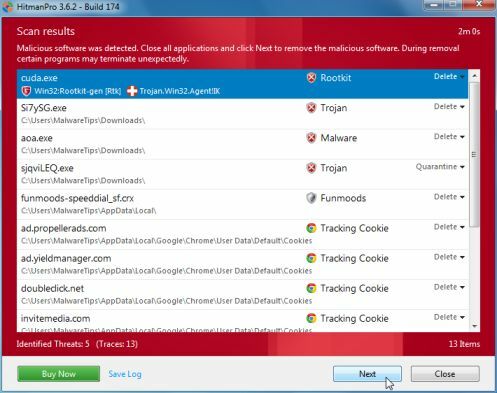 Malwarebytes’ Anti-Malware will now start scanning your computer for “Your computer has been blocked” virus as shown below. HitmanPro will start scanning your computer for “Your computer has been blocked” malicious files as seen in the image below. If you are still experiencing problems while trying to remove “Your computer has been blocked” virus from your machine, please start a new thread in our Malware Removal Assistance forum.